Sometimes we get asked about identifying delftware but we aren't experts about it and usually try to steer this question to people who are. But here are some things that might help….Identifying delftware is sort of a complicated process. You need 1) a good book to identify marks, and you need 2) a vibrant marketplace to set realistic prices. 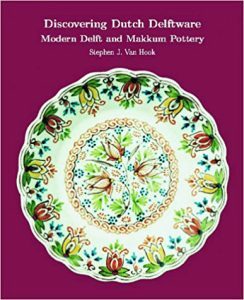 The book, "Discovering Dutch Delftware" by Dr. Stephen Van Hook has been created in recent years. I am not sure if it's still available but Amazon is always a great place to check for out of print books, used books are anything related to the book you are looking for. 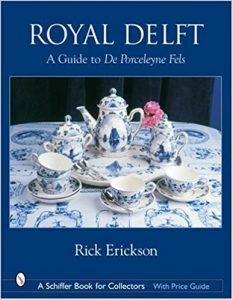 Books on delft are a bit rare and hard to find but another one you might like, if it's available, is Marks on Delft Pottery by Jean Justice. Using the word/name 'Holland' has not been exclusive to delft pottery cermacis for some time. The Dutch have marked the words Delft and Holland at the bottom of their pieces for generations Screen printed pieces, the most affordable, and mass produced, have this typed of labeling on the bottom. Hand painted pieces, the more expensive and exclusive pieces, are usually marked with the name of artist and a pottery mark and painted pieces often have brush strokes on them. If you see work like this, not only are they more expensive, but because they are handpainted, you will see differences in detail on each piece. The colors are a richer and deeper violet blue, courtesty of true delft blue. Marketplaces are different; they are ever changing and you will have to do your homework to find good ones for your pieces. It's hard to tell what something will go for. Deltf isn't something that most people know about and the only reason I am familiar with it is that my mom is Dutch. In our house, it was 'sacred'. Heaven help the one of us that would break a piece of mom's precious, beloved delft! The worth of a piece is partly based on it being an original, where it came from, how old it is and how much a buyer is will to pay for it. Reading up on your delftware it key to understanding the value of what you have. The marks on the pieces may actually be very misleading because a crown mark isn't always an indication of royal delft and the words hand painted or made in Holland aren't always a guarantee that is was. (Although our pieces ARE actually imported from Holland because we deal with a reputable importer). This is because the Netherlands doesn't have regulating laws about the Country of Origin labeling as other countries do such as the United States does. A Made in China label, to us, means cheap and poorly made, yet these pieces can sit right next to true delftware in Holland with no separation. Originally, the term 'Delft' derived from the town of Delft itself. The Netherlands started by producing tin-glazed earthenware, and eventually went on the produce other works. This was in the late 15th century though and many potteries sprang up in towns all over Holland in places such as Rotterdam, Haarlem, and Amsterdam. Because so much of it was being made and it had become so popular, and it had fast become the main source of production in the 17th century, almost 30 companies were working. Some of their designs were influenced by Chinese design, but when Chinese design ed pieces had stopped being imported in the middle of the 17th century, which was blue and white, the Delft potters were left to create their own designs and their creativity extended to a variety of colors such as gold, purple, blue, red, green and black. Eventually, when the potters settled in London, with additional influences there, Delft pottery began to flourish and eventually include flowers, ships, landscapes and biblical scenes. You will, today, see many lovely and intricately exquisite pieces of work reflecting just this influence. True Dutch delft may often have a gritty texture with a thick glaze and possibly a stippling on the surface caused by air bubbles when fired. Tin glazes may have crackling in it and will appear whiter. British delftware will often have a hint of pink or blue and the colors will be a bit muted. The glaze may be a bit glossier and smoother and does not craze as easily. Wipe with a damp cloth to keep clean and dust free. Do not use in a dishwasher. Keep from direct sunlight to avoid fading or any damage to the glazes. You wouldn't think that these pieces would face, but given how strong sunlight can be, you might be faced with having an original a beautiful violet blue on one side and a soft robins egg blue where the sun touched it. Take care of your delft pottery. Keep it out of direct light. Yes, we do ship outside the U.S, but because each case is different, we can't, and won't, make any automatic shipment prices like other websites do because often, this will actually cost you more money. In fact, it's to your benefit for us to get an approximate idea of the total weight of the shipped item and all additional costs (overseas costs will often require additional fees such as duty taxes, insurance etc) and then we can give you an much better final estimate. We do this for our customers rather than give a rounded and inflated cost of an item. Though this takes time, it does save you money! If you are interested, just let us know 🙂 We'll do our best to help you as best we can. Disclosure Rawhide Gifts and Gallery is a participant in the Amazon Services LLC Associates Program, an affiliate advertising program designed to provide a means for sites to earn advertising fees by advertising and linking to Amazon. com.